Microcontroller based (Arduino compatible PIC32) for firmware updates and customizable code. Set sensitivity as constants, use spare I/O for external devices, etc. Debug information via the serial/USB plug. 1500Hz of resolution should exceed your game code and high speed cameras, giving you as much reference data as possible. 8′ cord which can detach from the wireless controller. For more information and installation / ordering details, please visit the Controller monitor page. Currently Xbox 360 only. I’ve been thinking about a PS3 version, it would require a different approach, but more importantly, would companies want it? Please let me know. Size of display is 8″ x 8″ x 1.5″. 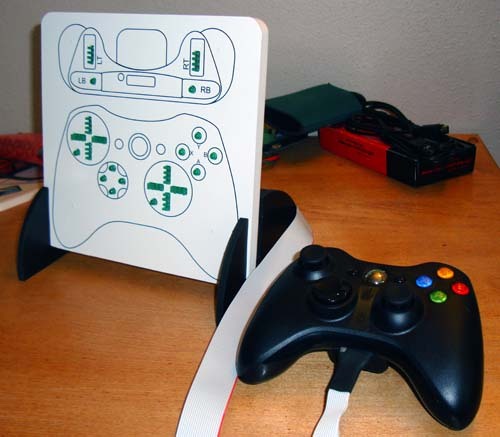 It connects via a 6′ cable to a wireless Xbox 360 controller. (Granted, it’s no longer “free of wires” but you know what I mean) There are screw holes in the four corners for mounting as you choose. The connector for the cable replaces the headphone / keyboard jack on the bottom of the controller. Charge & Play kits still fit. 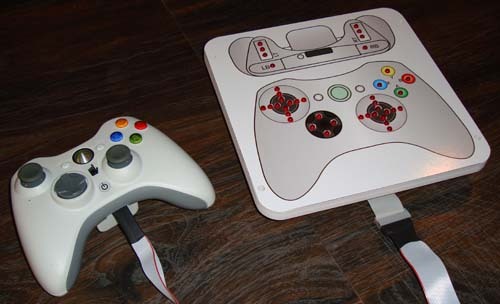 Display indicates the following: D-pad, A B X Y, left and right bumpers, left and right triggers, both analog sticks. Currently L3 / R3 (depressing the thumbsticks) is not represented. For the analog indicators there are 3 LED’s per direction. These indicate “any motion at all”, “halfway there” and “all the way over”. Cost is $650 US, includes controller. Shipping is extra. If this sounds like something that would be useful for your company please drop me a line to discuss. I’m setting up a batch within the next few weeks.